Marie-Catherine le Jumelle de Barneville was born in Normandy to a family of the minor nobility. In 1666, she married François de la Motte, baron d'Aulnoy, 30 years her senior and a known gambler and libertine. The couple had six children. In 1669, Baron d'Aulnoy was accused of treason but the accusations proved to be false. Marie-Catherine disappeared from the Parisian social scene around this time and for almost 20 years. She later said that she had spent many of the years traveling, including to Spain, and wrote her most popular works based on these trips. By 1690, Madame d'Aulnoy was back in Paris, where she presided over a popular salon. From then until 1703, Madame d'Aulnoy published 12 books: three historical novels as well as three pseudo-memoirs, a collection of short adventure tales, a history of King Louis XIV's Dutch wars, and two collection of fairy tales. Most of her books were immediately and hugely popular. The French considered her to be an historian and recorder of the exotic (that is, non-French); however, much of what she wrote was not history but stories she had read or had been told by others. The works for which Madame d'Aulnoy is best known today, Les Contes des Fees (Tales of fairies) and Contes Nouveaux ou Les Fees a la Mode (New tales, or fairies in fashion), were first published in 1697 and 1698. Unlike the folk-based fairy tales of Perrault, Madame d'Aulnoy's tales were "à la mode," or trendy, reflecting contemporary court and salon conversation. As a result, they have had to be considerably revised to make them suitable for children. 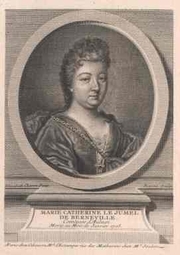 Marie-Catherine d'Aulnoy is currently considered a "single author." If one or more works are by a distinct, homonymous authors, go ahead and split the author. Marie-Catherine d'Aulnoy is composed of 25 names. You can examine and separate out names.